This is a mod I started a while ago and then abandoned. I've come back to it to polish up so it could be released. 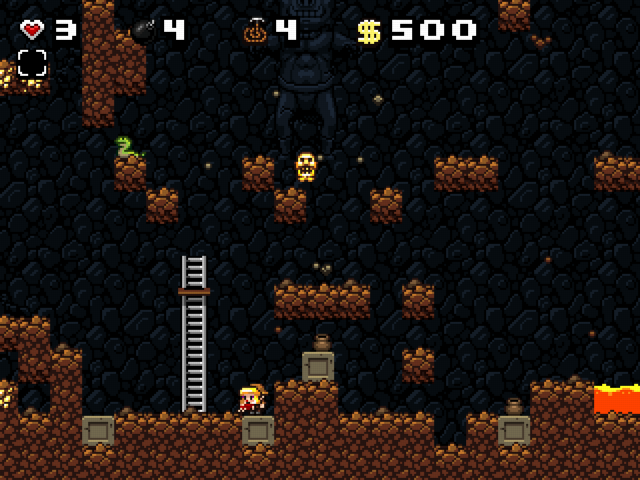 Spelunky Breakdown is my idea of what Frantic Spelunky could have been... Instead of having effects like screen shake and falling debris that are harmless and without consequence, the cave is actually collapsing around you. Forced speedrun. - Based on Spelunky 1.2 source. 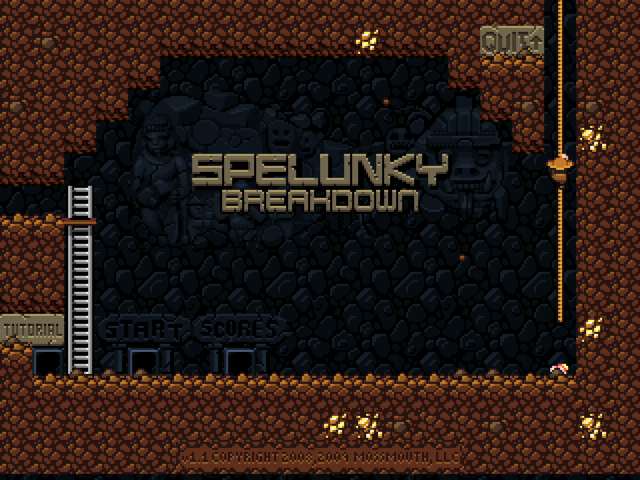 If you've already been playing Spelunky 1.2, place Spelunky Breakdown in that folder, and it will import your scores. Otherwise it will import your scores from the windows registry. I'll provide a link to a score file that unlocks all the shortcuts if wanted. - I've tried to keep the amount of random screen shake low enough so that it isn't annoying. You can disable the random shake in the options room. - All tan blocks are now pushable and effected by gravity. Watch your head! - All shops are closed. Most shopkeepers have cleared out or abandoned their shops and returned to the safety of the surface, but you may find a few that are still packing up. They won't take kindly to looters. - You won't be blamed for the destruction of shops and altars caused by the earthquake. - Sometimes when a block breaks, a mini-boulder will roll out. It can bowl you over for 1 damage, but you can be crushed if it stops on top of you. It can be pushed around after it stops rolling. - Debris falls from the bottom of blocks to indicate they're about to break. - After dying, press attack/use for quick restart, or press jump/escape to go to the highscores room. - Arrow traps can be triggered by blocks that break in their line of sight. - If you take too long, you're gonna have a bad time. The ghost is the least of your worries! - I've tried to reduce the chance of unavoidable and unfair deaths happening during the random chaos, but you're going to suffer more 'cheap' deaths than vanilla Spelunky. - Added options room where you can select from 5 difficulty levels and toggle the random screen shake. Difficulty level effects the speed the cave collapses, how soon random 'bad things' will happen, how horrible those 'bad things' are, the chance of finding damsels, the chance that remaining shopkeepers are armed, and a bit of the behaviour of the final boss. - Removed '-noshake' command line option. - Add the oBreakCustom object to the level with a magic sign. That's it. Ex: "?oBreakCustom"
- Optional: to force a certain difficulty level, set global.difficulty (from 1 to 5). Ex: "? !SET?difficulty!5"
- Optional: to disable hellfire (which can destroy the bottom floor), set global.hellCustom to false. Ex: "? !SET?hellCustom!false"
So if you get to the CoG it will give you tons of free gold without using bombs? 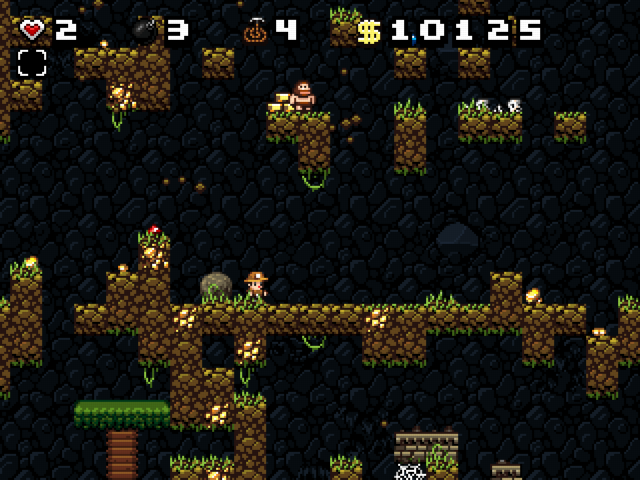 Hadn't heard of Frantic Spelunky before. I gave both a try and it's neat too, but this definitely feels more finished. So far I'm finding it quite entertaining. It's not necessarily harder (except maybe zone 3), but it definitely gives a while new spin on things. In sort I like it alot. Yup, lots of gold to be had. The amount of gold and loot that spawns in blocks has been reduced in normal levels because the 'make it rain' effect was a bit too much. Blocks in the final boss room floor break now and then, but I made it pretty slow so you can't just wait it out. The lava is intended. I'm happy to make it harder... I thought some might complain about it being too hard. I've added an options room where you can set difficulty level and toggle random screen shake. I'm tweaking the differences between difficulty levels and I'll list them when post the update. Maybe later today. I noticed the exit destroys any blocks that cover it. Obviously this is so it won't become inaccessible, but it's kind of weird when it happens while you're still pushing the block. Maybe it could happen only if the block is falling? Once when exiting though a door that no longer had a solid tile under it (just the new little ledge) with a damsel, she fell fell through the ledge, but never the less was waiting for me on the between levels screen. I'll try and figure out a less awkward way of getting rid of movable blocks in front of the exit. It was mostly a problem with boulders stopping there. Maybe check if it's still there after some seconds before destroying it. Oh..the damsel falling thru the platform but still getting credit... forgot to fix that! Thanks for the reminder. So I finally made it to the CoG. That was fun, but I also noticed something odd going on with the big statue. It seemed like some parts were staying visible after they were destroyed. Where is the options room? I can't find it. I haven't finished yet.. still setting all the difficulty levels. You can try what I have so far... maybe let me know if the hardest setting is hard enough yet. You can't miss the options room. Hellfire is really cool. I got stuck behind the glass in a craps shop (the top was gone so I jumped up into it) and a fireball hit me bounced back and forth and killed me. Is it intended that the CoG isn't always accessible? The Ankh is only present sometimes. I noticed in one version you could get in because the Moai head crumbles, but wasn't sure if that was a bug. Anyway, IMHO it would be best if it it were always possible to get there somehow. Oh, and this is a matter of taste I guess, I thought it was odd that pressing escape is the same as x on the game over screen. Fireballs spend a bit too long bouncing/rolling around - want to fix that. 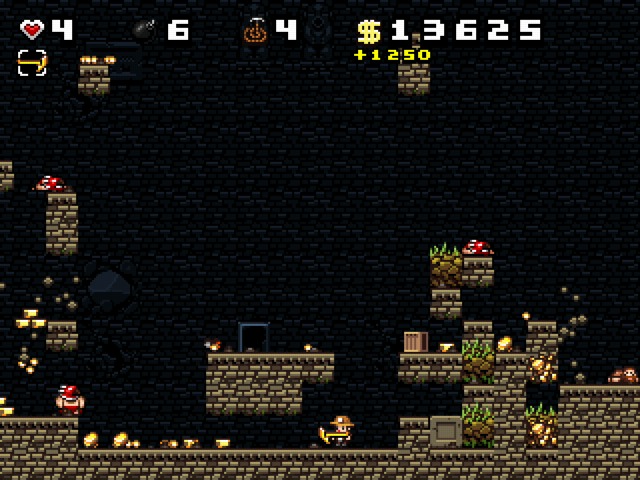 The hellfire destroying the bottom tiles was added just to force you to the exit...otherwise you could just rush to the bottom and wait for all the treasure and items to fall to you. The frozen region is changed to exclude the portion of the level that has scrolled past the top of the screen so sections you have already descended thru continue to collapse and you can't backtrack to a safe location. I'll make the Ankh somehow always get-able to prevent wasted CoG run attempts. The idea of having it randomly not there was that it would probably be the first thing a shopkeeper would take if they had a chance to grab something before they escaped, and it's pretty easy to find the black market now. The Moai crumbling was another thing just to remove any safe place to stand. I would want the escape key to return to the highscores room on game over... will fix. I overlooked that because I was using a gamepad. Thanks for the feedback guys..
One thing that annoys me is when you have stacked pushblocks, only the bottom one moves and you have to avoid the top one falling on top of you. I might look into getting this working: If there is a stack of 2 pushblocks, the top one will move with the bottom one when pushed; but if the stack is 3 or more pushblocks tall, it's too heavy to be moved at all. Actually, does anyone whos been playing the XBLA version know if it works in a more sensible way?